Acting EPA Administrator Andrew Wheeler has met with at least two former clients whom he promised to avoid directly interacting with, according to his personal calendar and meeting attendees. The meetings, particularly one that took place at EPA headquarters, violate the spirit of President Trump's ethics pledge, according to good government advocates. That pledge restricts the ability of former lobbyists like Wheeler, who took over EPA's top job in early July, from meeting with their recent previous clients. 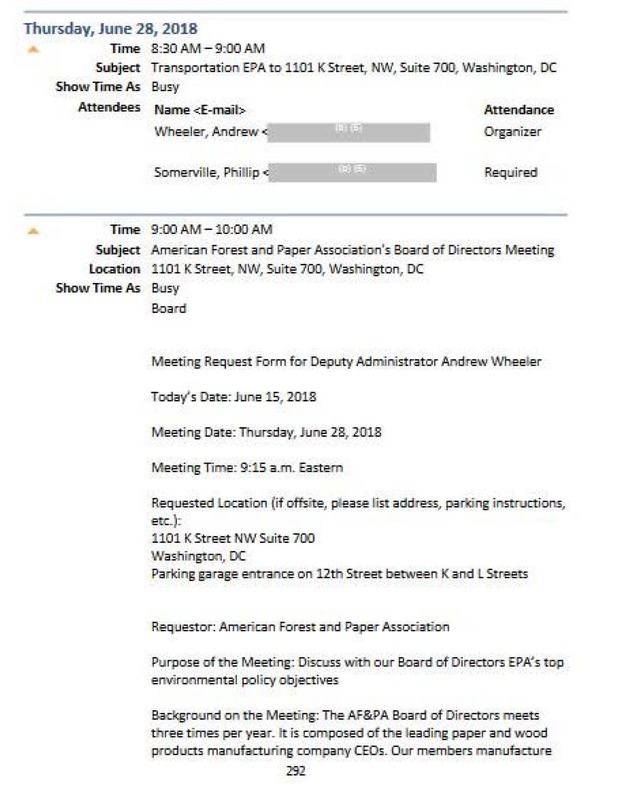 But on June 26, while Wheeler was still serving as former chief Scott Pruitt's deputy, he had a meeting at EPA headquarters with biofuels lobbyists and executives, including Emily Skor, the CEO of Growth Energy, the agency and biofuels trade group confirmed yesterday. They met at the agency's central offices in downtown Washington. The previous month, Wheeler signed a recusal statement in which he acknowledged that he is "prohibited from participating in any particular matter involving specific parties in which my former employer, Faegre Baker Daniels LLP, or any former client to whom I provided legal or consultative services during the past two years is a party or represents a party." Growth Energy was one of eight former clients — out of nearly two dozen that are publicly known — listed on Wheeler's recusal statement. The acting EPA chief said on his financial disclosure report that he had provided the trade group with "strategic advice and consulting" for more than $5,000 in compensation. Wheeler's recusal makes exceptions for interactions "of general applicability" during which "participation in the meeting or other event is open to all interested parties." That means "the meeting should include a multiplicity of parties representing a diversity of viewpoints," the statement says. "Generally speaking, at least four other parties should be present to ensure that a diversity of viewpoints is represented and not the same united perspective." The meeting with Growth Energy, which included more than a half-dozen members of biofuels coalition Fuels America listed as likely attendees, exceeded that numerical requirement, according to meeting attendees and EPA. But ethics watchdogs are skeptical that the attendees represented the required "diversity of viewpoints." Fuels America is a nonprofit registered with the IRS as a "social welfare organization." The mission of the corporate-backed entity is "to advance and support renewable fuel policies through advertising, communications, education and advocacy efforts," according to its tax returns. Meanwhile, the lobbyist who requested the meeting told EPA the executives "would like to discuss the timing/importance of the 2019 renewable volume obligations and their unified support for a strong renewable fuel standard," Wheeler's personal calendar shows. The document was obtained by E&E News via a Freedom of Information Act request (E&E News PM, Sept. 10). Growth Energy's presence in the meeting was not disclosed in Wheeler's public calendar, which EPA posts online. 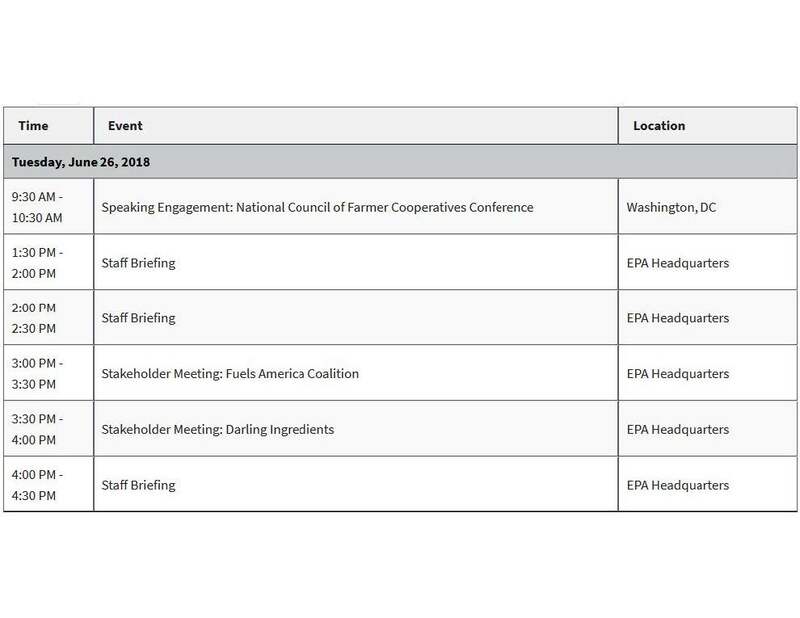 In that version of his schedule, it was logged as "Stakeholder Meeting: Fuels America Coalition." Taking meetings like the one with Growth Energy "undermines the very purpose of the ethics pledge," said Craig Holman, a government affairs lobbyist for the good government group Public Citizen. "What you have described to me is a lobbying meeting, pure and simple," he added. "Wheeler is being lobbied by one of his former clients." But EPA argued Wheeler's meeting including Growth Energy didn't violate the fine print of his pledge since it included a handful of other corporate executives. "In Acting Administrator Wheeler's ethics guidance, he is allowed to attend group meetings where his former clients may be in attendance if four or more parties are represented with a diversity of viewpoints, which was the case with this meeting, as every individual in the room had a difference of opinion on the [renewable fuel standard]," an EPA spokesman said. "Administrator Wheeler has followed this guidance and this meeting was no different." Some of the meeting attendees supported EPA's interpretation of the recusal statement. "Yes, Emily attended, along with a large number of attendees," Leigh Claffey, a spokeswoman for Growth Energy, said, referring to the group's CEO. James Carstensen, a lobbyist for DuPont who went instead of the DuPont vice president listed in Wheeler's personal calendar, said "there was a healthy exchange of opinions during the meeting." When asked whether the meeting had a "diversity of viewpoints," as the recusal statement requires, Carstensen said, "Yeah, I thought that there was. But it was a biofuels coalition." Kathleen Clark, a lawyer and a law professor at Washington University in St. Louis, Mo., who specializes in ethics, disagreed with that assessment. 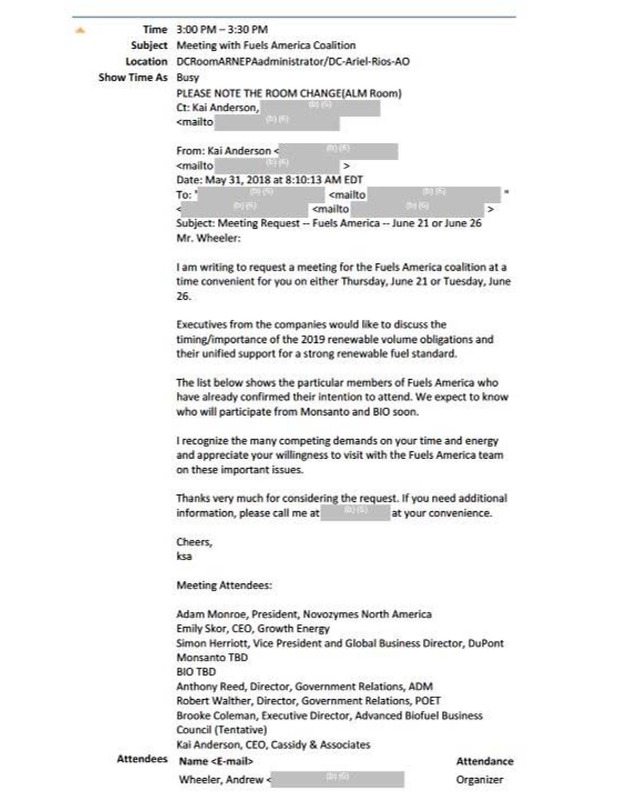 She noted the email requesting the biofuels meeting on Wheeler's personal calendar. "This email promises 'unified support' for a strong renewable fuel standard. We weren't in the room. You and I don't know what was said. But this email doesn't provide any evidence of a 'diversity of viewpoints,'" Clark said. 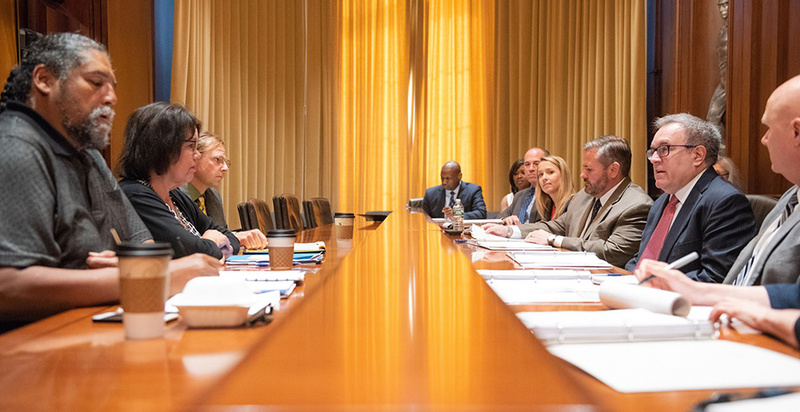 "There is no indication there were a diversity of viewpoints in that meeting," she said. "There was a multiplicity of parties, but there was not a diversity of viewpoints." Two events with Mark Sutton, the chairman and CEO of International Paper Co. — another company on Wheeler's client recusal list — were less clearly focused on swaying Wheeler. In both cases, he was invited to speak about the Trump administration's priorities to groups that included many corporate executives. 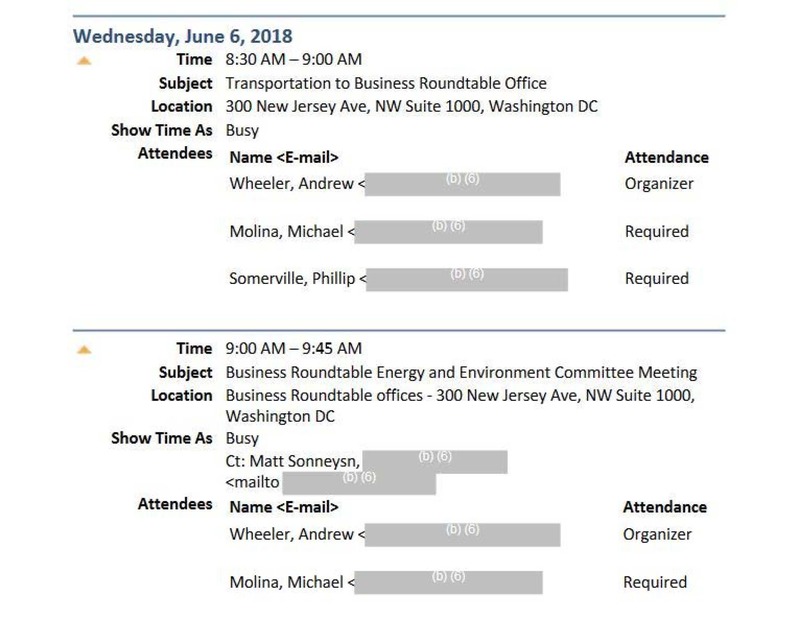 On June 6, Wheeler's personal calendar shows he delivered remarks to the Business Roundtable's Energy & Environment Committee, which is led by Sutton. Other Roundtable members include leaders from DowDuPont Inc., NRG Energy Inc. and Shell Oil Co.
Then on June 28, he spoke at a meeting of the American Forest & Paper Association's board of directors, on which Sutton is the second vice chairman. The association had asked Wheeler to address "public policy priority issues including carbon neutrality of biomass for energy, regulatory reform initiatives and permitting reforms, and clean water issues related to human health water quality criteria," according to his calendar. 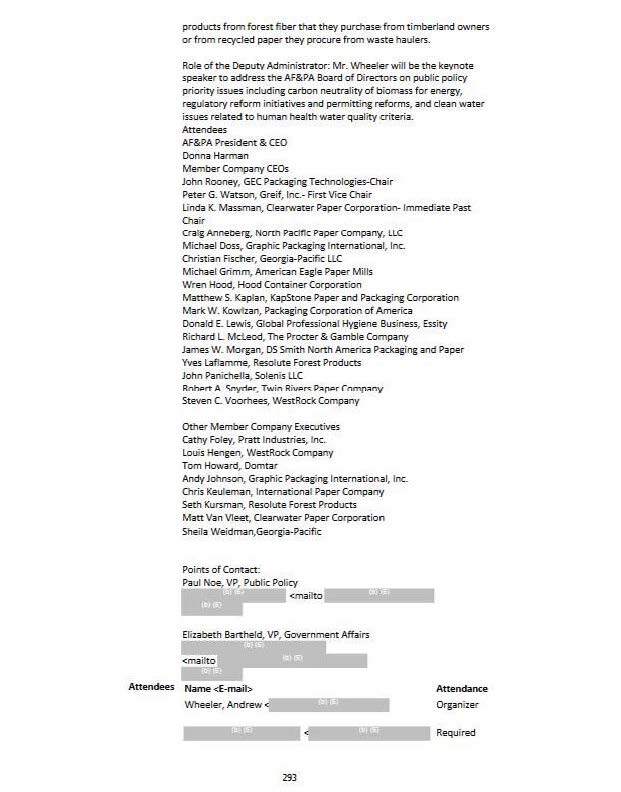 EPA and the paper products company previously confirmed that Wheeler and Sutton were both at those events. The agency argued they didn't run afoul of his ethics commitments (Greenwire, July 26). Holman argued only large events — not small gatherings — involving former clients should be allowed under Trump's ethics pledge. "The only reasonable exception is a big conference," he said.